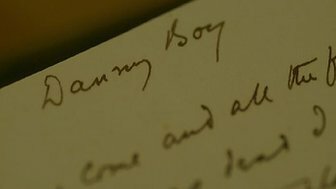 It is 100 years since the release of Danny Boy. The haunting ballad has been recorded by a who's who of iconic musicians including Elvis Presley, Johnny Cash and Bing Crosby. What is it about the song that has resonated with so many people for so long? The popularity of Danny Boy has stretched across the world from Britain to Ireland to America. With its sorrowful lyrics, it has become a common refrain at funerals. It was played at services for victims of the 9/11 attacks in New York and at Elvis Presley's memorial. Elvis believed the song was "written by the angels". 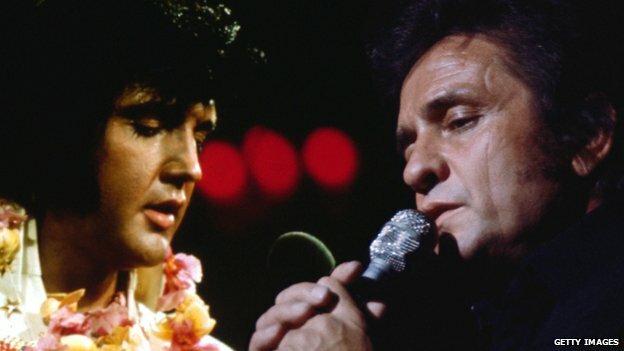 Johnny Cash, who often sang about sin and redemption, explored a darker interpretation of the song in 1965. The melody of Danny Boy - called the Londonderry Air - was also played at the funerals of President John F Kennedy and Princess Diana. "Although the words were written by an Englishman, the fact that they were written to the Londonderry Air is possibly a source of pride to people who see themselves as having an Irish identity," says BBC Radio Ulster presenter Brian Mullen. "It has retained its popularity, possibly because it has been recorded by nearly everybody so has reached a large market." The origins of Danny Boy have long been the subject of debate. The melody itself is believed to have been penned by the blind Irish harpist Rory Dall O'Cahan in the late 16th or early 17th Century. Did Franco rob Derry of Eurovision glory? Folk legend says that Rory, having collapsed drunk one night by the riverside, heard fairies performing a melody on his harp. He then performed the tune as O'Cahan's Lament. In 1851, in Limavady, County Londonderry, music collector Jane Ross was moved by a beautiful tune she heard from a violinist across the street. It was O'Cahan's Lament. Jane transcribed the melody which was published in 1855 under the title Londonderry Air. Several lyricists attempted to put words to the tune, but it wasn't until the 20th Century that it merged with the words we know today. Fred Weatherly, an English barrister who moonlighted as a songwriter, had written lyrics for a song named Danny Boy in 1910. His Irish-American sister-in-law Margaret Weatherly sang him the melody of the Londonderry Air. Fred adapted his lyrics to the tune to create Danny Boy, which was published in 1913. No credit was given to Margaret - who died penniless in 1939. Danny Boy was released just prior to World War One. With its images of loss and parting, and hints at reunion, the song became an anthem for the troops. Nobody is sure whether Weatherly's lyrics are deliberately ambiguous. Some think Danny is going to war, while others believe he is leaving Ireland for the New World and his mother is bidding him farewell. Although the singer is generally seen as being a wife or lover, they can also be interpreted as a parent. This flexibility has added to the song's appeal as people can interpret it in a way meaningful to them. Although the lyrics were written by an Englishman, who allegedly never set foot in the country, the familiarity and local origin of the melody all but ensured Danny Boy's popularity in Ireland. Such success was further secured when many of those Irishmen who fought in the war returned with the refrain in tow. Singers like John McCormack were performing it in music halls around the world and recorded versions became increasingly available as the gramophone gained popularity. When Danny Boy crossed the Atlantic its popularity soared. Huge numbers of Irish migrated to America in the 1920s, and they took Danny Boy with them. Its sense of longing for home and memories of the land and people left behind mean the song has strongly resonated with Irish emigrants throughout the century. "Its long-time popularity, especially among the Irish diaspora in America and Britain, has made it a bonding agent for exiles," adds Brian Mullen. "It is a way for them to recognise themselves, and others to recognise them, as a group." Why does Danny Boy evoke such an emotional response in people? "There is something about the way that music works on our emotions that is more visceral and powerful than words" says musician Joe Jackson. Each phrase of Danny Boy has an arc structure, that rises and falls, which Jackson feels enhances the song's poignancy. "It's almost like the sun coming out and the clouds passing over it again, which is very Irish," he adds. Musicologist Katie Overy explains how listening to music is a holistic experience. "Music activates more parts of the brain at the same time than any other activity we know about to date," she says. "Danny Boy has several features that combine to make it an emotional experience for many listeners, from its dramatic structure, large pitch range and familiar tonality to its historical, geographical and cultural associations." It had always been Fred Weatherly's intention that Danny Boy would work as a force for unity. He was fond of the fact that, in his words, "it was sung all over the world by Sinn Feiners and Ulstermen alike". 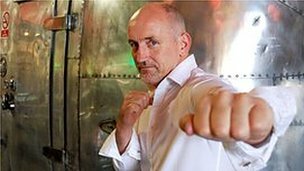 The song's impact as a unifying force was evident at the height of the Troubles in Northern Ireland as it helped boxing legend Barry McGuigan bring together two divided communities. McGuigan told BBC One NI's 'Danny Boy: The Ballad that Bewitched the World', "I think sport has a unique ability to bring people together. I'm proof of it, and Danny Boy had a lot to do with that. Whether you were Catholic or Protestant people all felt that Danny Boy belonged to them and they owned it." 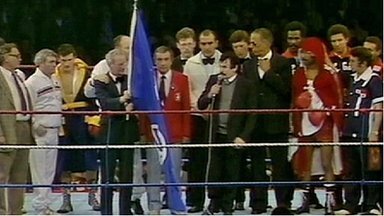 Needing an anthem to be played prior to his world title fight with Eusebio Pedroza in 1985, McGuigan had a problem - he didn't want to opt for either the Irish or British national anthems. "I didn't want people feeling ill at ease going to my events because there was enough threatening stuff going on all around us and so we all decided that dad would sing Danny Boy," he says. Pat McGuigan performed Danny Boy in the ring, creating a highly charged atmosphere as large parts of the audience joined in like an accompanying choir and inspiring his son to the victory that would bring him the world title and spark celebration across Northern Ireland. But when he come, and all the flowers are dying / If I am dead, as dead I well may be / You'll come and find the place where I am lying / And kneel and say an "Ave" there for me. "The song is probably the greatest ballad that was ever written," says McGuigan. "In sunshine or in shadow - the song is both uplifting and melancholy." Danny Boy's popularity has not diminished. The 100th anniversary of the song was marked by a mass sing-along in Derry-Londonderry, the UK City of Culture in 2013. With its evocative melody and open meaning, it continues to resonate with new generations. "All the flowers are dying, and they will be for a long time, but then they'll bloom again and Danny will still be on the road. You never know, because somewhere the pipes, the pipes will be calling." BBC Arts: Did Franco rob Derry of Eurovision glory?